Peter Marcus creates large-scale composite prints using a unique collagraph printmaking process. 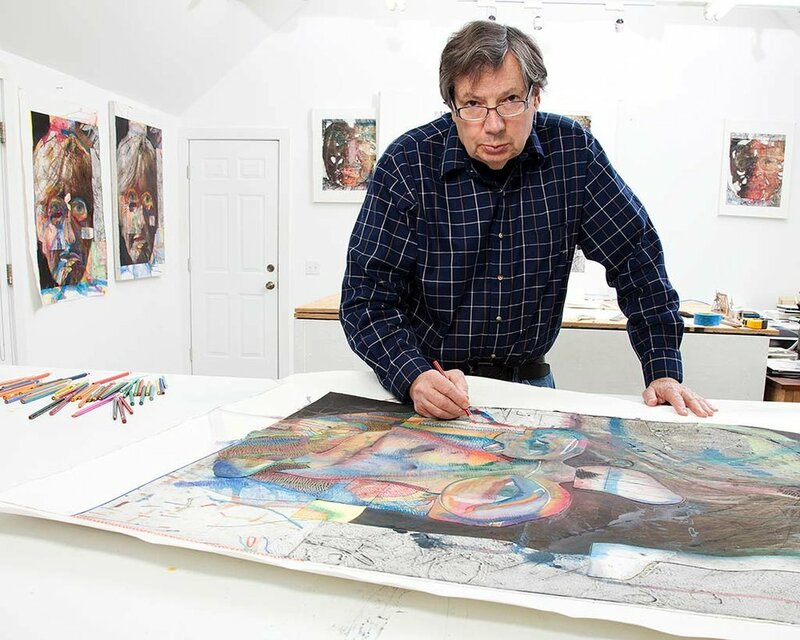 He says that his work crosses boundaries between painting, printmaking and drawing. As a professor of art at Washington University in St. Louis, MO, for over thirty years, Marcus began experimenting with large prints of buildings. After several years of retirement in Jamestown, Rhode Island, he turned his attention to the face, creating provocative portraits of his friends and family. Originally from New York, Marcus obtained a BS from Parsons School of Design and an MFA from Brooklyn College, with special studies in printmaking at the Scuola del Libro in Urbana, Italy. Marcus has exhibited nationally and is represented in the collections of the Newport Art Museum, St. Louis Art Museum and Dallas Museum of Art, among others. Rockport Publishers, Inc., Glouchester, MA, 1997. 45 Contemporary American Printmakers, 1999.